These rib-sticking lamb chops call for the grill but, no worries, they can definitely be done in the oven. We used more marinade and dry rub because some of the seasonings will stick to the grill during the cooking. Recipe courtesy of Jerk Central. See their profile -- type Jerk Central in the Search Bar. Sprinkle approximately two teaspoons per pound of Jerk Central's Jerk Dry Rub on all sides of the meat and RUB it in! Next, apply approximately 1.5 teaspoons per pound of Jerk Central's Jerk Marinade on all sides of the meat and RUB it in! Place the chops in a large Ziplock bag or resealable container and let the meat marinate for a few hours or overnight. Add the red wine vinegar, jerk marinade, jerk rub, rum and mint jelly to a sauce pan and heat on high. Use a wooden spoon to stir and break up the mint jelly as it melts. It should be well incorporated by the time the liquid starts to boil. Once the mix starts to boil, remove it from heat and keep stirring. Use a spoon and taste a cooled sample. It should be sweet, tangy and have a well-flavoured "kick" to it. Set up your grill for two-zone grilling. (Fill your charcoal chimney with coals and once lit, scatter them inside the grill in an area approximately 1/3 to 1/2 of the grilling area.) That will be your "hot zone". The other portion of the grill that is empty will be the "cool zone". If you will be baking your chops, first add a few tablespoons of oil to a pan and sear the chops on all sides for about a minute, or so, per side. Then put the chops in a baking tray and bake at 375 degrees F for about 35 minutes or to desired "doneness". 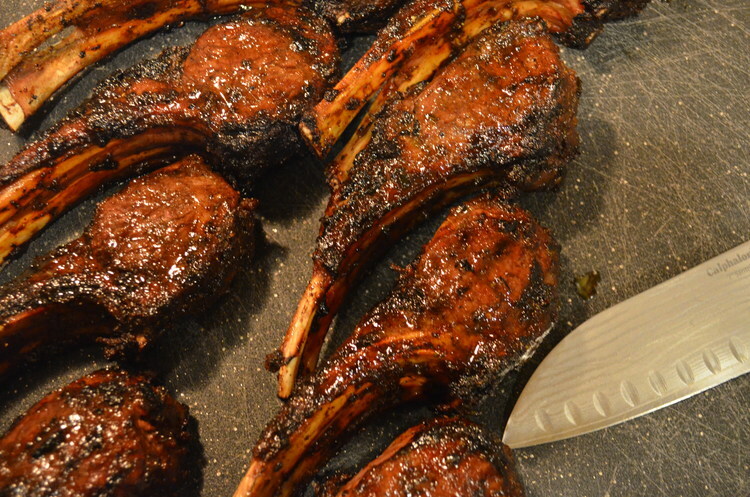 Back to the grill: Place your chops on the hot zone and sear for a nice crust. Don't walk away from the grill, this process should only take about a minute per side. Once all sides of your chops are nice and crusty-brown, transfer each chop to the cool zone. If you prefer your meat medium-well or well done, place your chops with the rib meat facing the coals. If you prefer your meat medium-rare, Place the meat with the rib (bone) end facing the coals. Apply a nice glaze of the sauce to each chop. Close the lid of your grill and let the meat cook for 15 minutes. Make sure to watch the temperature of your grill and adjust the vents if need be to keep the temperature between 375 - 400 degrees F.
After 15 minutes, turn the chops over and apply the sauce to the ribs again. Close the lid and leave the ribs for another 15 minutes. After 30 minutes of cooking, check the temperature with a meat thermometer for preferred doneness. Once the ribs are done to your liking, drizzle a teaspoon of the mint sauce over each chop and serve with your favourite starch or vegetables.